For my class in "Ministry and Context" at SFTS with Dr. Charlene Jin Lee, we were assigned the assignment of watching a video (not a common seminary assignment). 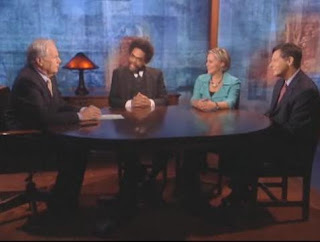 It was a Bill Moyers conversation with Serene Jones, Garry Dorrien, and--one of my all-time favorite theologians/philosophers--Cornell West on a variety of topics all dealing with political theology; specifically, that peculiar and unique way of being in the world as the Church. I found the whole conversation extremely interesting and challenging. These three address with masterful eloquence, both the particularity and the openness of a Christian theology which moves not only in the hearts and souls of Christians but also aggressively and lovingly in the streets among the urban poor and the halls of Capitol buildings and corporate offices. "How deep is your love? What is the quality of your service to others? Are you concerned about those on the margins, or do we define a catastrophe only when it relates to investment bankers and Wall Street elites, as opposed to the precious children in chocolate cities? ...The cross signifies unarmed truth and unconditional love crushed by the Roman empire, embodied in the flesh of a first century Palestinian Jew named Jesus. So that you can be a non-Christian, concerned with poor people. Sometimes some of the greatest defenders of our poor brothers and sisters have been secular and pagan and Hindus like a Gandhi, and so forth and so on. Very much like brother Obama's economic team. They're not looking at the world through the lens of poor people and working people. They got Wall Street elites as their buddies, their cronies, intimate ties, so the vantage point through which they look at the world is very, very different. Christians begin with the catastrophic."